Having explored the Cheltenham Brickyards and Badlands we walked up Mill Street and into the village of Cheltenham. The dominant feature in the area is the Niagara Escarpment which offered prime building material, close to the surface. Large red pieces of whirlpool sandstone were cut and used for major public buildings in Toronto and other urban centres. 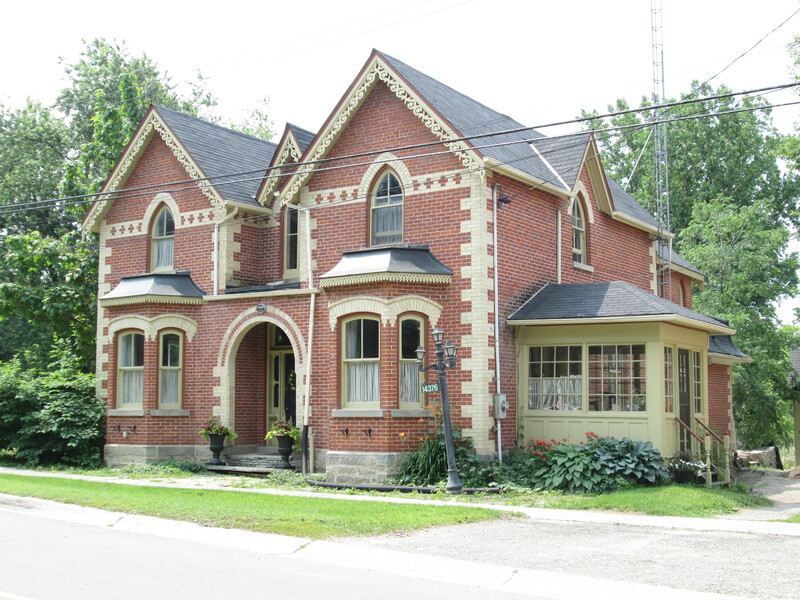 In Chingaucousy Township, outcroppings of Queenston shale proved perfect for making terra cotta (Terra Cotta) and bricks (Cheltenham). 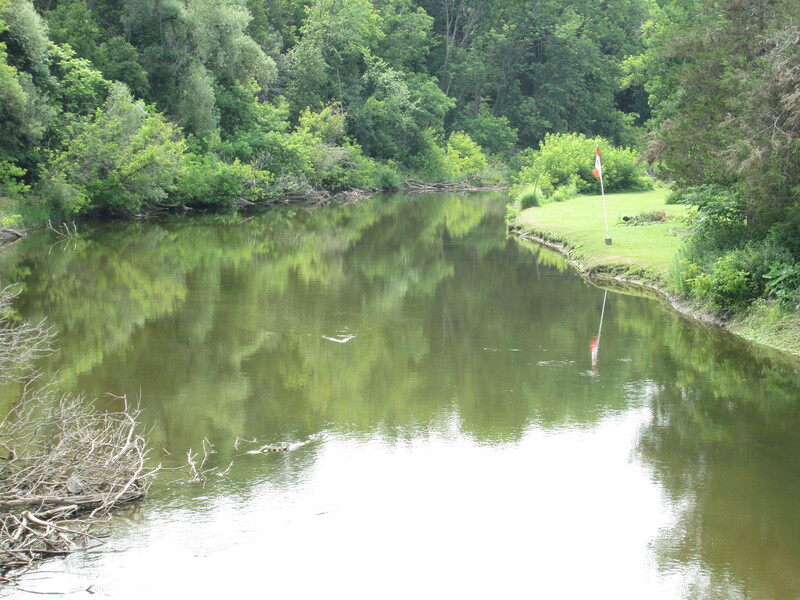 The Credit River winds its way through farms, past mills and industrial sites and provided power and transportation to the early settlers. Charles Haines emigrated from Cheltenham, England and arrived in York (Toronto) in 1817. 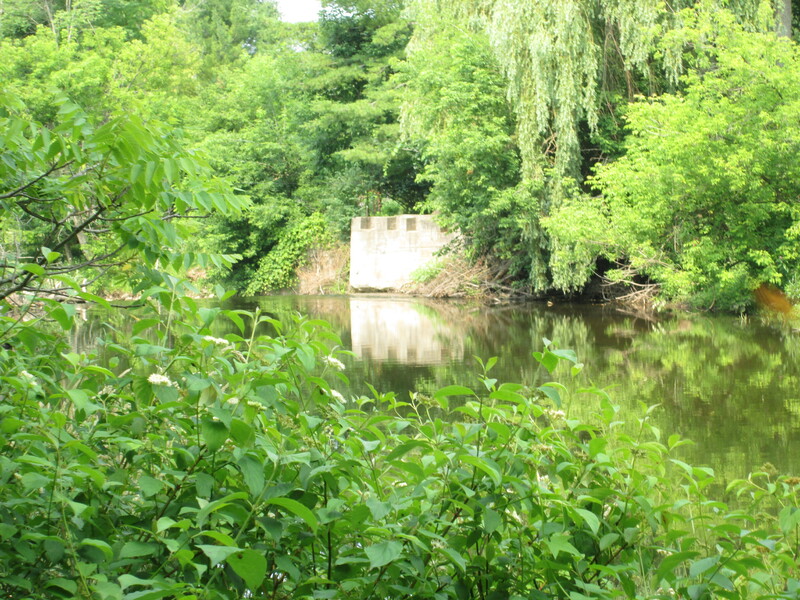 Charles drew a half lot on the Credit River that had excellent prospects for a mill seat. His first grist mill in 1827 was built of logs and had a single run of stones. As the needs of the farming community increased a larger mill was required and Haines built a new one with three run of stones. Haines was taking advantage of increased grain production in Peel as well as grinding American grain. Under colonial tariffs it was lucrative to turn American grain into Canadian flour and sell it to England. The grist mill burned down in 1945 and only the foundations remain. This is why Cheltenham has no mills on Mill Street. The picture below shows the remnants of the dam structure as seen from the south side of the river. As you look across the Credit River you can see remains of the dam on that side as well. More imposing is the structure of the saw mill. The first saw mill was erected by Haines around 1835. The existing structure is reported to be the third one on the site. 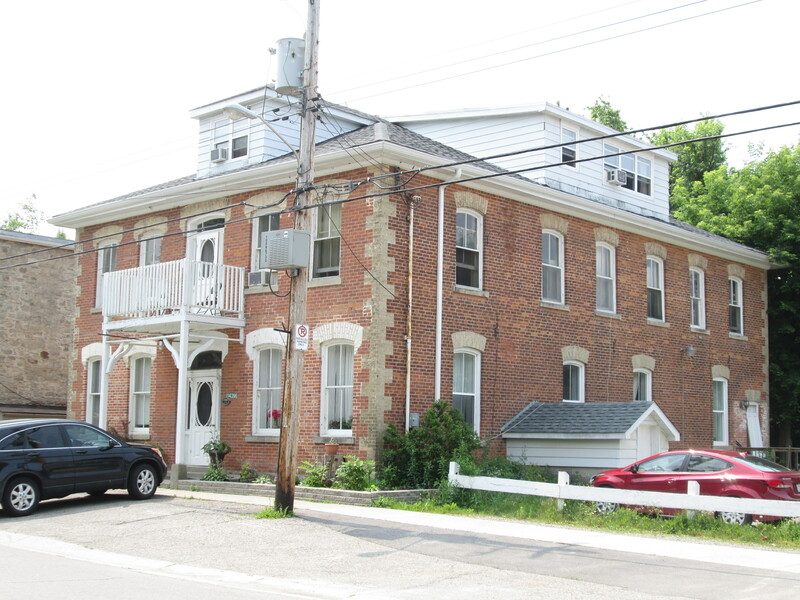 It was built around 1886 and is one of the few remaining saw mills that are close to Toronto. It is also featured in the cover photo in a shot from Mill Street. 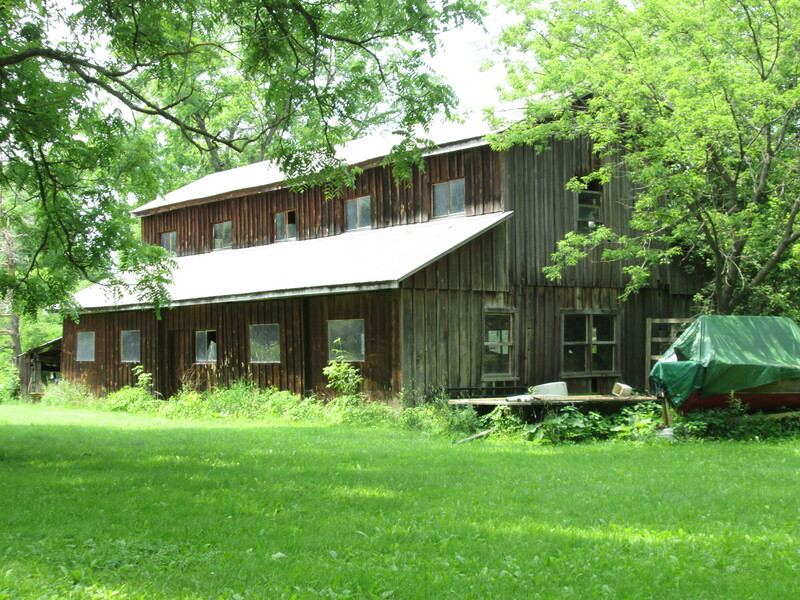 Across from the old saw mill, also on Haines property, is a building called the Honey House. In this building Theodore Haines, followed by his son Rusty, keep an apiary. Cheltenham is surrounded with meadows where a wide variety of flowers are in bloom. Here, the bees can collect nectar which is basically sucrose and water. They use an enzyme to convert the sucrose into glucose and fructose and then eliminate all but about 18% of the water, making honey. This building is made of yellow and red brick, possibly from Interprovincial Brick, in the most interesting pattern I have yet featured. Although the bumble bee doesn’t make honey it is useful in it’s own way. Like the honey bee, it collects pollen from flowers and transfers it to other flowers, completing the process of pollination. 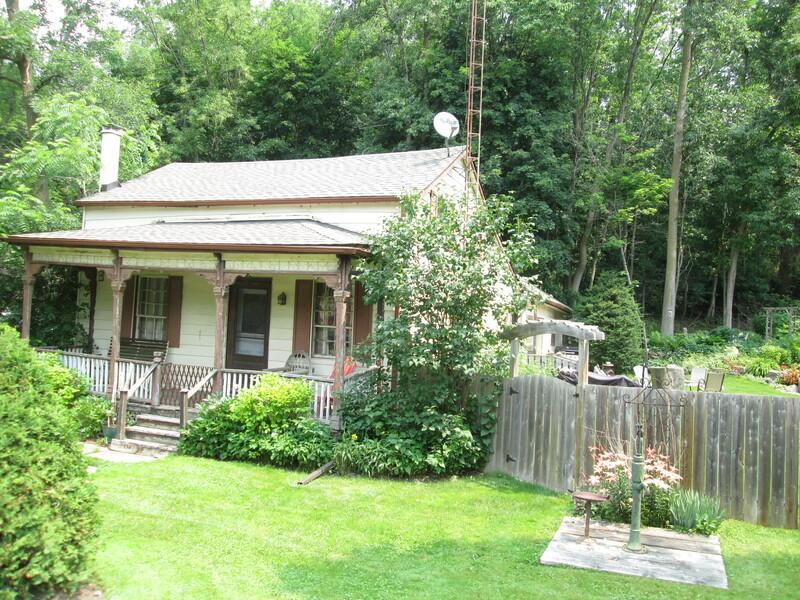 This house was built by Frederick Haines Sr. beside the general store following the fire of 1886. In addition to running the general store and the grist mill Frederick was a key figure in the town. The dichromate brick in this house gives beautiful decoration to the home. The extended bay windows give the house a symmetry around the arched entrance. The building was used as an antique store during the 1960’s and 1970’s before being used as a retreat for the United Church. It has now come full circle and serves as a private residence once again. When a fire destroyed several buildings on the main street they were quickly rebuilt. 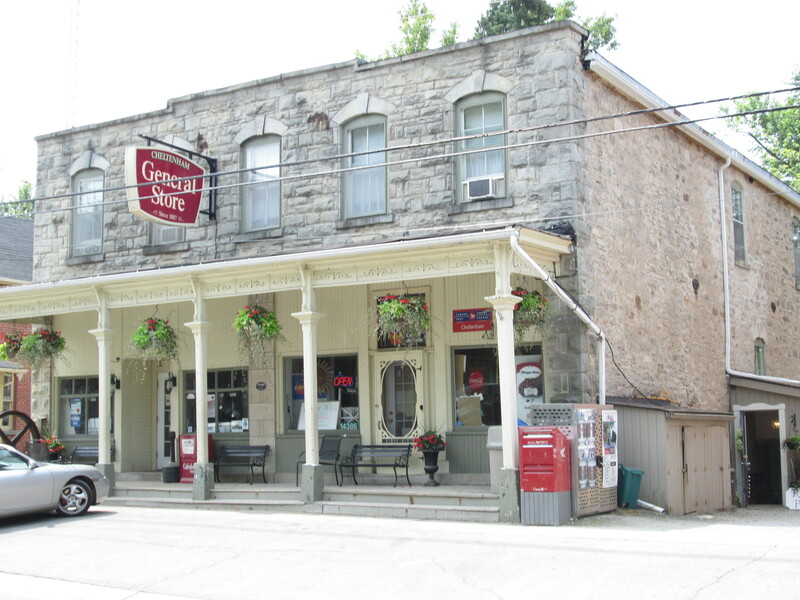 The General Store is located in a building made of local sandstone and limestone which replaced an earlier frame structure. It was built in 1887 and has served a wide variety of uses over the years. As well as being the general store and post office it has also been a bank, library, tailor’s shop and a doctor’s office. When the telephone came to the community it housed the first local switchboard. Also, Cheltenham’s first gas pumps were located in front of this building. William Henry opened a frame inn beside the general store in 1848. Lost to the fire of 1886 it was replaced with the brick building that stands here today. The Cheltenham Hotel has dichromatic brick using yellow for corner quoins and window lintels to offset the red brick, making the building look more substantial. The town has a large collection of historic buildings including several homes on the main street. The one pictured below with the fine scroll work sits across from the end of Mill Street. It was built around 1875 by Charles King who had purchased the property from Fred Haines in 1870. The front lawn still sports the well and water pump. This pump was made by R. McDougall & Co. in Galt. McDougall was a manufacturer of heavy steel equipment from the late 1880’s until they were bought out in 1951. They specialized in lathes, but also made water pumps, including the one at Earl Bales house and at Spadina House. Charles Haines built his second house in 1835 on the top of the hill over looking the valley with his milling empire and the town it spawned. 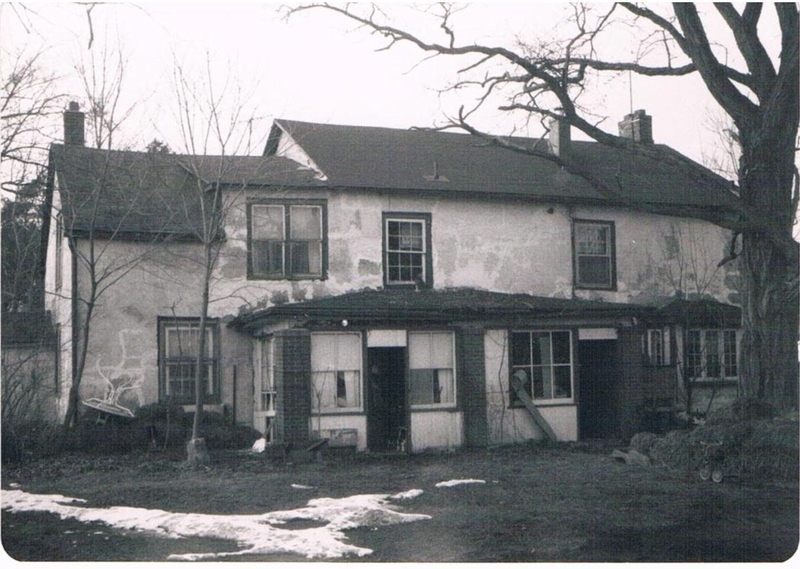 The house is pictured below prior to restoration in 1988. 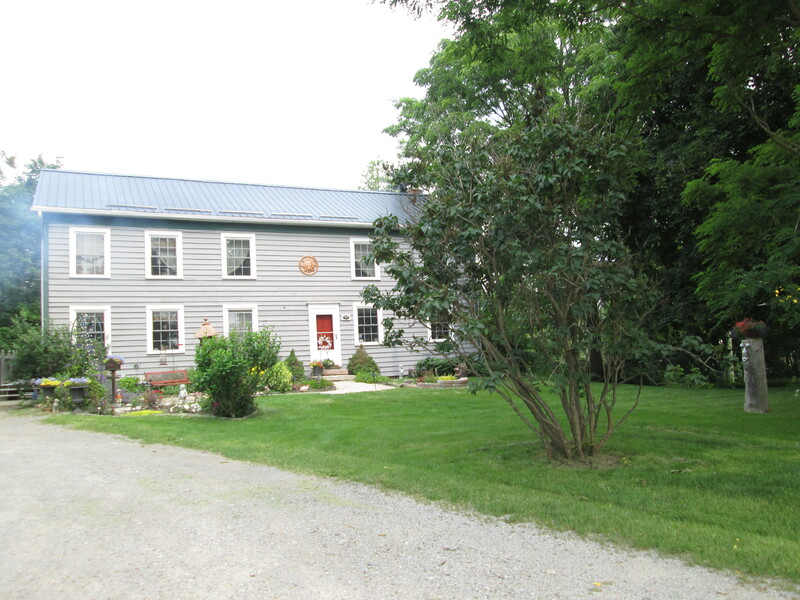 The restored Haines house has now been converted to a bed and breakfast which is conveniently called Top Of The Hill. The owners are related to Charles and Martha and the house has been in the family since it was built. In 1988 the house was stripped of some of its additions and lifted up to get a new basement. Guests of the B&B can relax among family antiques and read the diary written by Charles’ son, Charles, which describes life in the pioneer town. The Credit River flows through town and makes a beautiful tapestry to portray the trees and the nearly still Canadian Flag. 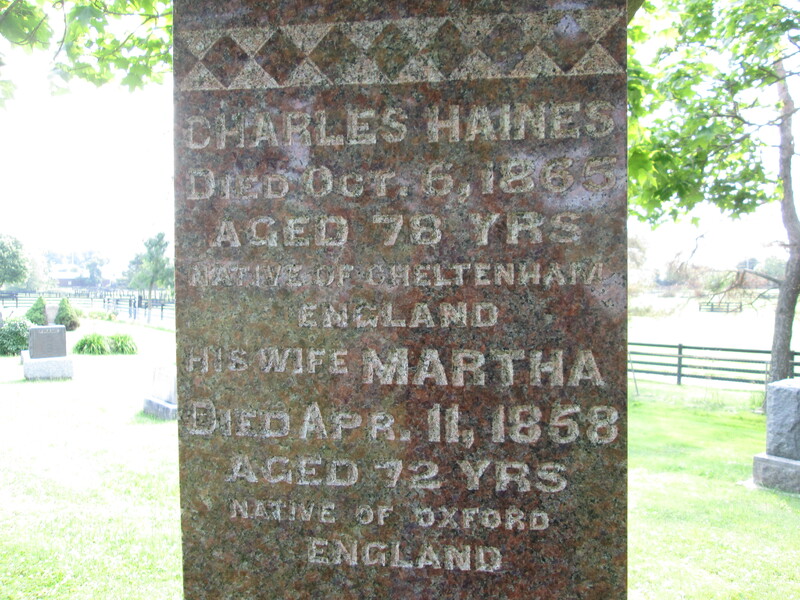 Charles Haines lies buried in the cemetery across the road from the fire hall. His legacy includes transferring the name Cheltenham from the UK to Upper Canada. Several heritage buildings in town were built by himself or his direct descendants. Cheltenham is a picturesque village which retains much of its historic form and buildings. 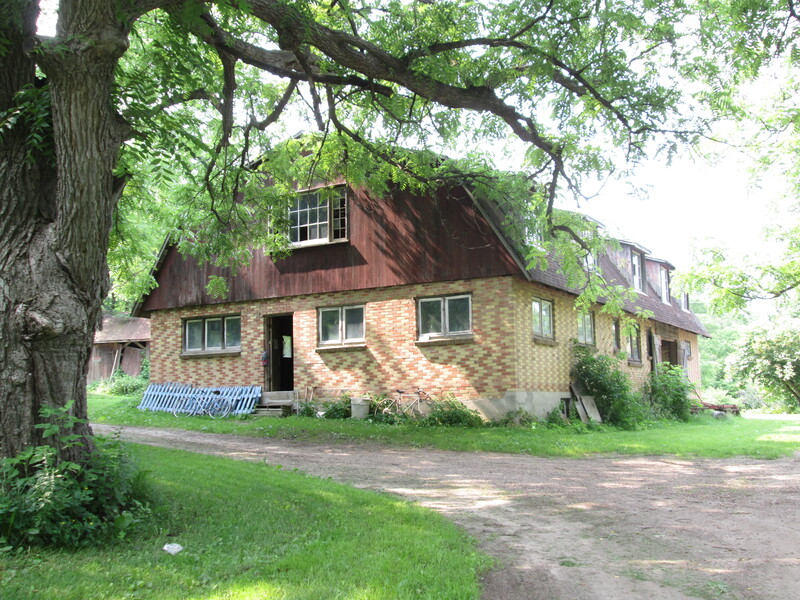 For this reason it is designated as a Cultural Heritage Landscape and many of its buildings are designated under the Ontario Heritage Act. 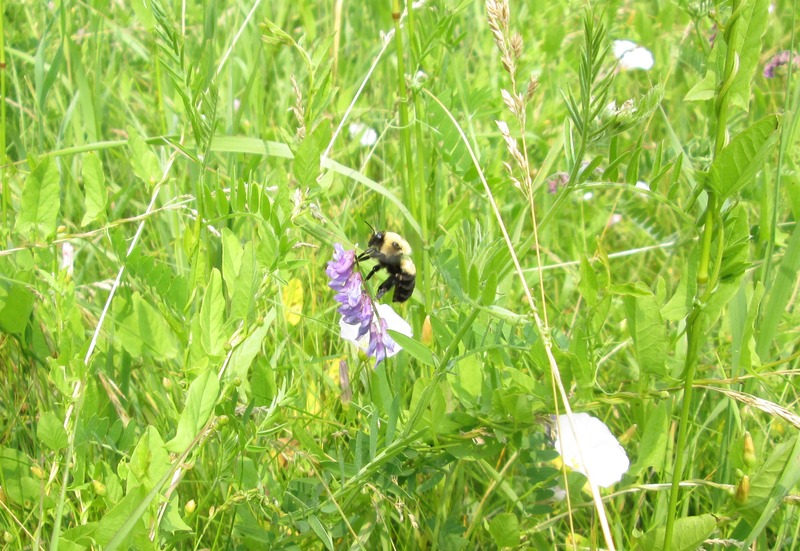 This entry was posted in Credit River, Uncategorized and tagged Apiary, Bumblebee, Charles Haines, Cheltenham, Cheltenham Mills, Top Of The hill on July 9, 2015 by hikingthegta. Top of the Hill was sold recently and no longer functions as a B & B. Sad to see it leave the ownership of Charles’ Haines’ descendants. BTW Charles is interred in the small cemetery across from the fire-hall. My mother was the eldest daughter of Alfred Haines, son of Ebeneezer Haines. The property on the river always brings back good memories to me. It is now in the hands of the family of Theodore Haines, son of Alfred Haines. Sadly, the honey house has burned to the ground, and is no longer a presence on the river. So sad to see it go. I am seeking permission to use several photographs of Cheltenham for a newspaper article for the Peel Region Review. Can anyone help me contact the owners of the photos? Thank you. Thank you so much. I’m hoping to get the best resolution for newspaper and web publication. Is there a way to source original renders, or is what is on your blog the only available? I would like to see the painting. It might be a good fit if the publisher agrees. The article is a little bit of Cheltenham history, the Bruce Trail, and Credit River. A photo of the Cheltenham General Store would also be ideal. Thank you. Vern, if you get in touch with me via email, then I can send a copy of the painting. This forum makes it impossible for me to post photos. Hi John. I sent my email address in my last comment but didn’t hear back. I don’t have your email address. Hi Vern. I just got back from a photo shoot and just now have sent a private email to you.